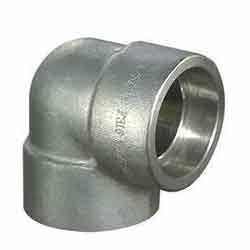 We offer a wide range of steel elbows forged fittings that are available in different sizes. Grades : ASTM A182 F304, 304L, 304H, 316, 316L, 317, 317L, 321, 310, 347, 904L, etc. Class : 150, 300, 600, 900, 1500, 2000, 3000, 6000, 9000. Looking for Steel Elbows Forged Fittings ?